When animals move in, their waste will need to move out! Raccoons and Opossums will create a “toilet” in an attic or crawlspace or even on the roof! Once this “toilet” is established, the animals will continue to use them indefinitely. This soiled insulation will reach the point of saturation and urine may begin leaking through the ceiling and into your home or business. To avoid costly repairs, the wildlife infestation must be removed as soon as possible and the clean up initiated. The longer the waste is allowed to accumulate, the greater chances of infectious diseases growing in this waste. 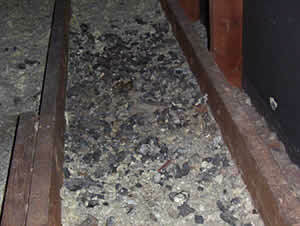 A clean attic or crawlspace is essential to the health of the occupants. Waste can filter in through ceiling cracks or the attic access hole. The waste and damaged insulation will be removed, your attic returned to broom clean condition and the area disinfected. New insulation will be installed in the attic with either your choice or rolled or blown in types. A fresh blanket of insulation will also save you money on your heating and cooling costs. New Federal standards call for added insulation in attics to combat the high costs of heating oil, natural gas and electricity. We can also put an extra layer of insulation on top of the existing one for maximum protection.